Add fresh water to the offerings in your bird sanctuary using the Allied Precision Heated Bird Bath with Plastic Pedestal. This robust unit is loaded with features that will bring birds into your backyard every season. The generous, 18.75" diameter basin has a textured surface and contoured rim, helping birds securely land and grip it. The gradual slope creates a 1.75" deep bath, enabling small birds to bathe and large birds to drink and preen with ease. The hidden heating element uses 150 Watts of power, and automatically turns on when the water temperature nears freezing. This aids in keeping the water free of ice on even the coldest days, and the unit has been fully tested in sub-zero conditions to ensure it will not crack. The bath securely attaches to the included plastic pedestal, which sports a slightly angled design for interest and excitement. A plug on the base of the pedestal allows you to run your extension cord (not included) through it, to power the heated bath and shield the electric components from the elements. Fill this pedestal with sand or gravel for added weight, and place it on virtually any level surface for a centerpiece in your landscaping. Integrated mounting hardware on the basin keeps it securely connected to the stand, ensuring it cannot be knocked off its pedestal by other animals. Hardware to attach the bath to your deck rail is also included, for use without the pedestal. The beige color of the unit adds a vivid and natural hue to your yard, and its straightforward design will make it a favorite accent for both you and your birds. 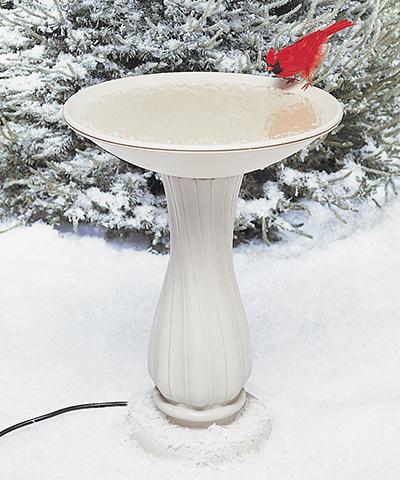 Help your feathered friends get water in the winter with this Heated Bird Bath with Plastic Pedestal. Made in the USA. Three year warranty.